There are many mysteries connected with César Franck’s The Seven Last Words of Christ on the Cross: Why was it never performed while the composer was still alive? Or, did Théodore Dubois, Kapellmeister at Ste Clotilde and Franck’s successor, find the manuscript and perform it in public under his own name? And finally, was the work really penned by César Franck? At least the last question can be answered clearly today: Yes, The Seven Last Words of Christ on the Cross has been rightfully attributed to the Frenchman born in Lüttich. It carries the composer’s handwriting – both literally and figuratively speaking. 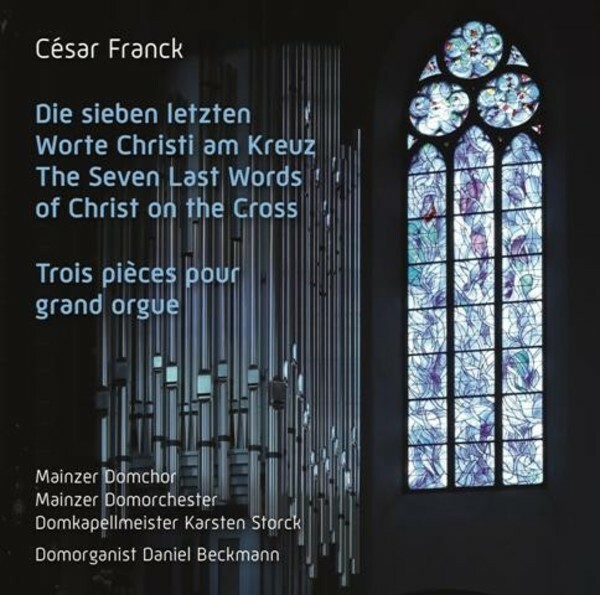 César Franck does not stand alone in setting the ‘Seven Words’ to music. While the works with the same title by Heinrich Schütz and Joseph Hadyn used only the respective words of Jesus as a textual basis, Franck reached much further and made use of material from the Old and New Testament, as well as the Stabat Mater. He thereby created for himself an interpretive open space which he used ingeniously for his musical objective: César Franck’s Oratorio begins delicately and clearly, and soon develops to monumental dimensions. Domkapellmeister Karsten Storck has succeeded with an outstanding interpretation, live from the Mainz Cathedral and with large symphonic instrumentation. In the second part of the CD, cathedral organist Daniel Beckman takes to the keys: the Trois Pièces pour grand orgue, which César Franck wrote for the 1878 Paris World Exhibition, are today considered to be among the most impressive works in organ literature, thanks to their powerful scope of sound and dynamics.